Bell tree has leaves, which is known as belpatra. Three leaves are connected to the same type. It is considered as one leaf. Belpatra is used in lord Shiva’s worship and it is incomplete without belpatra. 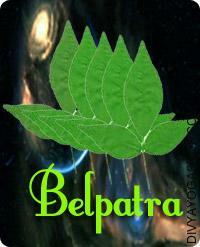 Belpatra has divine and medicinal use. Its use can remove many diseases. There should be three leaves in one belpatra. The leaves should not be broken and hole. Always offer belpatra from smooth side. One can use one belpatra several times by washing it. Do not offer belpatra without pouring water. Take 108 belpatra and write Ram on it with white sandalwood. Offer it on Shivaling by chanting “Om Namah Shivay”. When you offer 108 belpatra then worship for getting early marriage. This measure is extremely beneficial in savan month. Take 108 belpatra in savan month. Take sandalwood fragrance in one bowl. Dip every belpatra in sandalwood fragrance and offer it on Shivaling. Chant “Om Hom Juhu Saha” while offering belpatra. After that worship for good health. Take the belpatra as your age. Take milk in one bowl and dip every belpatra in milk-water and offer it on Shivaling. Chant “Om Namo Bhagvatye Mahadevay” on every belpatra. Worship for getting child. One can do this remedy on any day of savan. Belpatra juice is beneficial to increase vision. Drink belpatra kadha with honey to get rid of cough. Drink 11 belpatra leaves in morning. It is beneficial to get rid of old headache. Good Luck: Lord Shiva becomes very happy if one worship by playing damroo. It is beneficial to play in the morning.